One of the secrets of the markets that many do not know is that periods of low volatility is often followed by periods of high volatility. High volatility is then followed by a period of low volatility. Take this secret and master it and you will have a very powerful weapon in your hands to make money in the stock market. Low volatility is characterized with stock prices trading in a small range. For example, the stock might trade within the $40-$42 range for some time. The period can be from a few days to a few months. Then you will see the stock move very fast in a few days or weeks. That is a period of high volatility where prices can move 2-3 points in a single day. If you are swing trading, your stock may be moving down 1-2 points a day for the past week (High volatility). Then all of a sudden the stock forms a doji. The stock closes at the same price (Low volatility). Then the next day, the stock reverses higher and moves up 1-2 points every single day for 2 weeks (High volatility). Notice the progression from high volatility to low volatility to high volatility again in 3 weeks time. As a trader, you will make money when there is volatility. So, volatility is your friend. You want to avoid stocks that are in low periods of volatility. You then search for stocks that are about to enter periods of high volatility and jump in and ride the stock till the period of high volatility ends. In the chart above, you can see ARIA which is a perfect example of how low volatility is followed by high volatility. In late August to early September, the stock was consolidating and it traded sideways moving very little from one day to the other. Volatility was very low at that time. Then when it broke above the trading range, all of a sudden traders jumped in and help to increase the stock's volatility. If you have been a smart trader, you would have put this stock on your watchlist. You would have put an alarm which will alert you the moment the stock breaks out. In October, this stock again traded sideways with less movement compared to the breakout. Then this stock broke down and had a swift drop. Volatility increased overnight. As the stock drop to near the 200 MA support and price support, the stock stopped dropping. Volatility decreased. Then the stock had a gap up and volatility immediately increased and the stock shot up rapidly in a week. 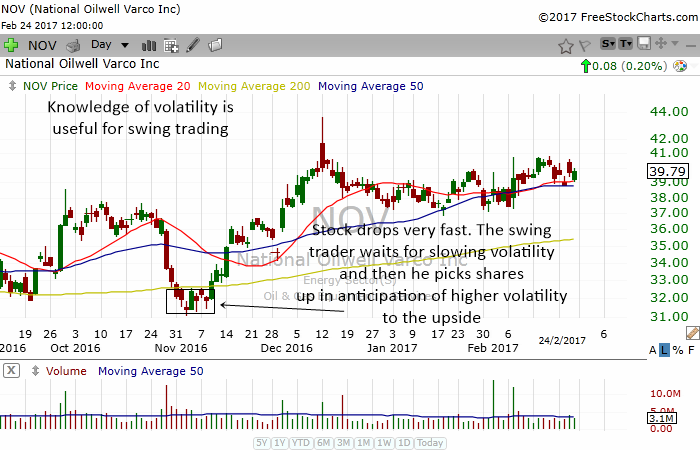 This stock actually provided a a few very good swing trades for smart traders. 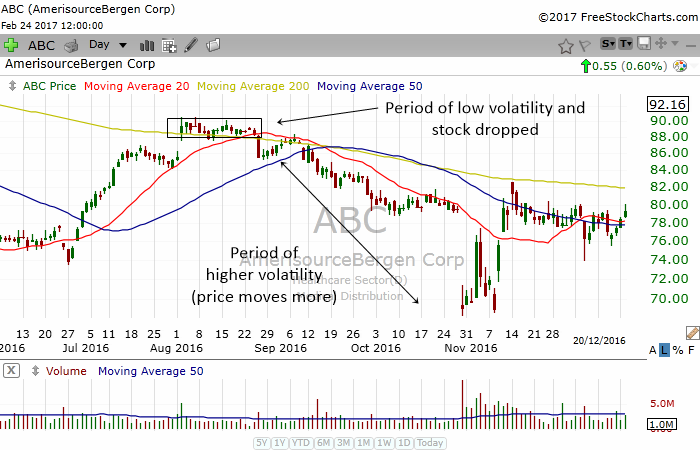 The chart of ABC above shows how low volatility hints of another big move in the stock. The stock had a period of high volatility as it rose from July to August. Then, the stock moved sideways as it hit the 200 MA resistance. The stock could not overcome the resistance and it soon fell. Volatility immediately crept in as it fell. The stock had a higher period of volatility in September and October. Notice how in November the stock gap down and then holders of the stock were taken for a wild ride. This was a period of extreme volatility, When the stock reached $80, volatility slowed down. 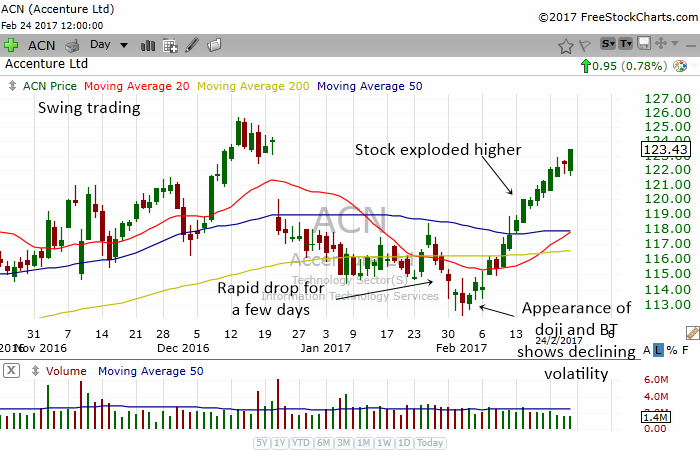 In the chart above, you can see ACN had a rapid drop in the last few days of January. Then dojis and bottoming tail start to appear. These candle patterns are reversal patterns but they also point to slowing momentum or slowing volatility. Notice how the stock rose after the lower volatility period. High volatility follows a period of low volatility. A knowledge of volatility will enable you to be able to spot excellent swing trading opportunities. In late October, NOV fell rapidly for a few days. Then a little doji formed. A bullish green bar then showed buyers stepping in. Then 2 bottoming tails formed. What this tells us is that volatility is slowing down and a reversal is about to happen. The stock was also at the 200 MA support and this gave us a very strong case for a bullish swing trade. Smart traders recognized this and started buying the stock. Immediately, the stock's volatility increased and the stock shot up rapidly. Do you like to play breakouts? If you like to play breakouts you will benefit tremendously by knowing how to spot periods of low volatility that sets up a good breakout play. 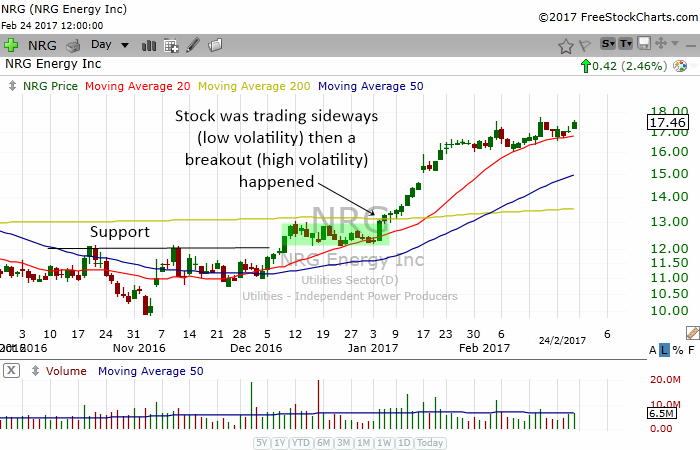 In the chart above, NRG had a period of sideways trading from mid December to mid January. The stock's volatility was low at the period. 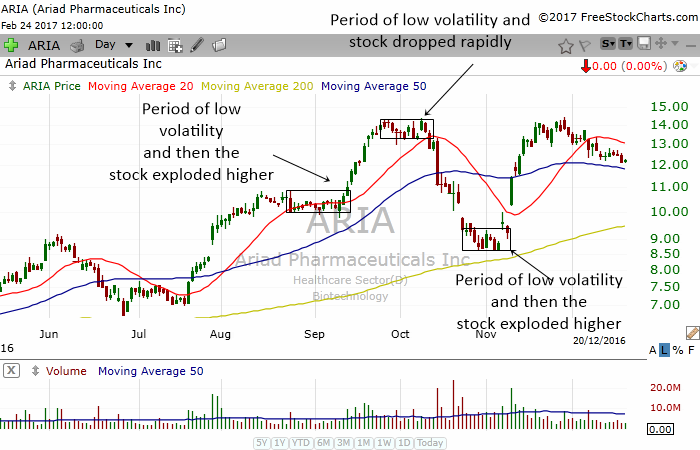 The stock then breakout and a period of higher volatility followed. 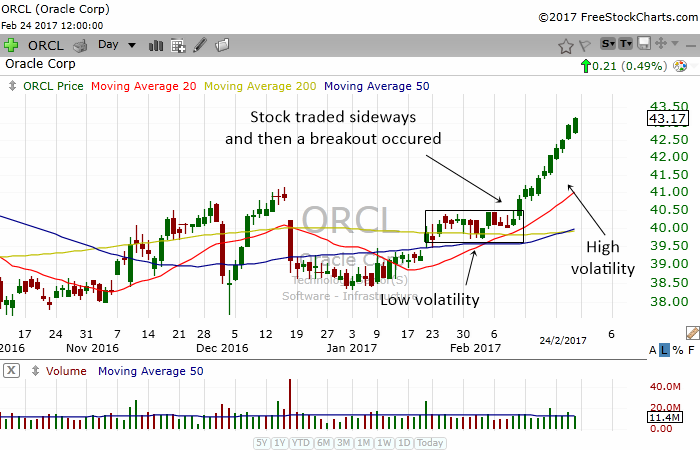 The chart of ORCL above looks similar to the previous chart. The stock traded sideways for awhile experiencing a period of low volatility. It then exploded higher and higher volatility followed. If you want to enjoy periods of action in the stock market, you need to study the volatility in the S&P 500. If you trade during periods of low volatility you are wasting your time and locking in your money. You want to trade stocks when the S&P is beginning a period of higher volatility. The chart above shows the 60 min chart of the SPY. For a few days, the SPY was trading sideways. It was a period of low volatility. If you are a smart trader, you would know to expect a period of high volatility very soon. 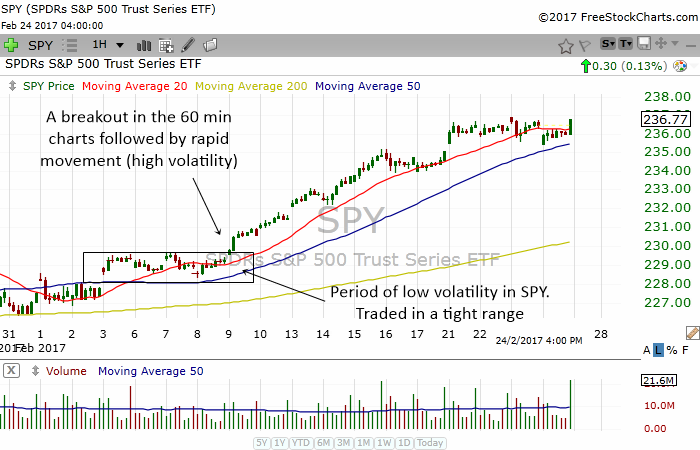 The SPY broke out of the trading range and the smart trader will pile into stocks as the volatility increase in the SPY.